This is a list of Israeli websites that stores user password as plain text. For anyone who don’t understand why you should care see this. A mail to the web admin was sent, I’ll update if they’ve changed their ways. I recently gave a talk in KernelTLV Meetup. The talk was uploaded to YouTube, so if you’re interested, go a head and watch it. The Talk is in Hebrew, but the slides are in English. Sadly, when cloning a repository from Gerrit. the Gerrit’s commit-msg hook is not populated in the local repository git hooks folder. Here’s a neat trick that I just learned that always puts that there. In this post I will share a git pre-commit hook I created for aiding with code beautification. In Linux, I work in two different coding styles: User space and Kernel. The Linux kernel has a very specific coding style and every commit to kernel must adhere to that style. The Linux kernel provides a very neat script named checkpatch.pl that can be used to check if your patch adheres to the kernel style. It also works on complete files. but, can’t we automate this ? well, here’s come git hooks to the rescue. Git has an option of providing a scripts that can run before or after certain workflow stages. For instance, if you ever worked with Gerrit, you probably used Gerrit’s commit-msg hook provided to generate a unique Change-Id token embedded in the commit message. One hook that is particularly interesting in this case is the pre-commit hook. As one might speculate, this scripts runs just before the commit action by Git and has access to Git objects. The hook I’ve written, basically runs on all the file in the commit and runs astyle (Artistic style) against each of them. astyle if a very cool command line tool that works on various platforms. It runs against a set rules describing how to do spacing, indentation and various other beautification stuff. It then rewrites the original file with the fixed style. You can grab the hook in Github. Please feel free to fork and enhance it. Currently astyle works on complete objects (files). I would prefer it will only work on the objects diff in commits. This is the last post in the series of a local AOSP gerrit server setup. In this post, We’ll finalize the configuration of Gerrit, add new branches for development and see how to maintain the setup. In the last post, we’ve finished creating the project in Gerrit. When we develop locally, we should work on our own branches. Basically, you choose a branch/tag that you want to use as a baseline and start working from there. As we know, in Android, there are too many projects to do it by hand for each project. Let’s see how we can do it for all of them in one command. For that, we’ll use the following Gerrit command line: gerrit create-branch. As we did before, we’ll apply this command inside a repo forall command, so our Gerrit command will be applied to all projects. First, we need to decide on the baseline. For each release, Google releases a build code associated with a manifest branch. We’ll need that tag. build code / manifest branch pairs can be taken from here. For this tutorial, we’ll take the following Lollipop build LMY48B, which suits Nexus 5 (Which I own). Let us first init an empty repository with that branch, and of course, we’ll do it from our server. Great, don’t just do repo sync yet. we want to examine the manifest first. The default revision tells which tag to checkout for each project. Let’s take the android-5.1.1_r3 tag and branch out of this tag to our own branch. This will be our baseline and we could push our changes directly to that branch. To do so, let’s go back to the mirror on the server, we’ll need to do another repo batch command. You should see sometimes the error message “fatal: invalid revision “android-5.1.1_r3“”. This is ok, it happens on project which don’t have the tag. This project are not included in the manifest we set our baseline on. Now, when the new branches are let’s create our own manifest. We’ll go back to the place we initialized the repo. This is a git repository, it’s actually a project, so let’s create our own branch. git commit -m "My new manifest branch"
Let’s see now how we can update our gerrit and mirror and get upstream changes from Google. And now, run the batch script we ran before. Our setup can’t be finished until we know for certain that after reboot our gerrit server will start again. To achieve that, we need to add Gerrit as a system service. I’ll show here how to do it in Ubuntu server (Debian like), for other dists like please find another tutorial online. Basically, gerrit can be easily be installed by chkconfig. problem is that chkconfig is no longer supported in Ubuntu, which now uses upstart for it’s init process. Couldn’t find a it on the net, so I need to write it myself. When it will be ready, I’ll post it in the blog. Meanwhile, here’s an ugly, working way to achieve that. Hi. This is part 2 of the “How to set local AOSP Gerrit server”, you might want to start with part 1 here. In part 1 we’ve downloaded all the necessary stuff and in this post we’re going to set it all up. First thing, let’s bootstrap Gerrit. Gerrit needs to work with a database, it support various types of database. for this tutorial I chose MySQL. This commands create a Gerrit user, a database and sets the required permissions for the Gerrit user. Download and install it now [Y/n]? Copy gerrit-2.11.war to /home/gerrit2/review_site/bin/gerrit.war [Y/n]? Allright. We’ve got Gerrit running now. A thing worth mentioning, the first user that logs into Gerrit becomes an admin. so make sure to login first with the administrator user. Gerrit can work with several authentication models. I chose OpenID for this tutorial. Let’s get started. open up a browser and browse to Gerrit site. In the upper right corner you should see Register and Login links. Register first using OpenID and log in. Now, let’s set our SSH keys so we can work from command line. we’re doing it as the Admin user for the Ubuntu Server, not as the Gerrit user. Your identification has been saved in /home/serveradmin/.ssh/id_rsa. Your public key has been saved in /home/serveradmin/.ssh/id_rsa.pub. Copy the entire blob to clipboard and paste switch back to Gerrit web interface. On the upper right corner of the screen, click on your user name and then on Settings. On the left menu that appears click on “SSH Public Keys” and paste the blob in the white box and press add. Hi Administrator, you have successfully connected over SSH. The former will be used for administration, it will have permissions to review, merge, delete, etc. The latter will have only view and submit change-set permission. Now, let’s create a parent project for all the AOSP tree. All configuration we apply to that project will be inherited to the children projects. if we skip this step, all AOSP projects will inherit from the default “All-Projects” project, which is too global. On the Gerrit GUI, Press on Project -> Create New Project. Tick the “Only Serve As Parent For Other Projects” and press on “Create Project” button. 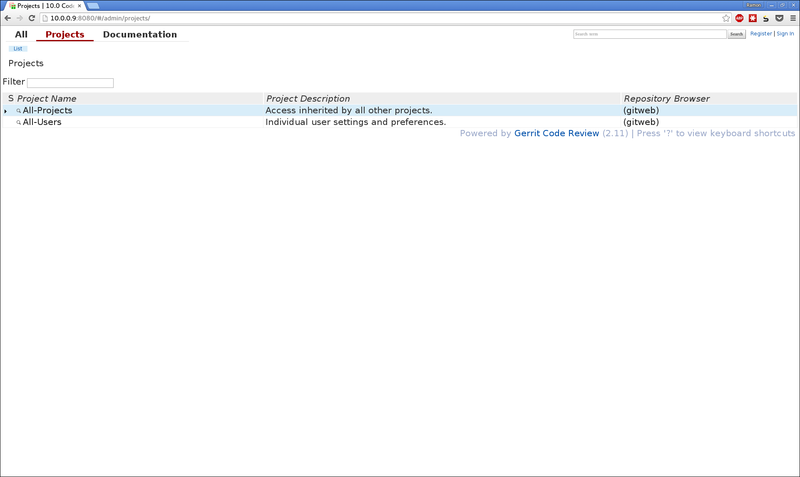 Click on Projects -> List, and select the Android project. Click on Access and Edit. Now it’s time to push all Android projects to gerrit. The Second command will change the parent project for all the projects we’ve just created. Select Android and Press on General. In next step, which will take some time, we’re going to push all of git tags and objects to the projects we’ve created. It may fail, but if it is, you can run it again until it succeeds. I found that increasing the Virtual machine RAM solved the issue for me. That’s it for this time, in the next part I’ll show you how to maintain the gerrit server. how to add it as a startup service, how to update the mirror and push new releases of Google in to it. Part 3 is ready, here’s the link. In this tutorial I’ll explain how to set a local gerrit server that hosts Android source code. After completing the tutorial you’ll have a fully runnable local AOSP mirror with local Gerrit server. First thing first. we need a Linux server. if you don’t have one available, you can use a pre-installed Ubuntu 15.04 Server I created – here. Actually, this tutorial was tested on this machine, so you’re unlikely to get in trouble if you use that. This tutorial assumes that package management is apt-get. If you’re using other, please do the appropriate adjustments. I choose to work with mySQL, put you can also work with various other DB software. consult the Gerrit documentation here.